Welcome to my Daimlers & Lanchesters, the photographs and text relate to Daimler & Lanchester cars I have owned and driven over the last twenty odd years. The technical specification of these motor cars survive in magazine and text book archives, I hope to portray an idea of what each individual model is like to own and use on today’s roads. Over twenty five year’s ago, following a lifelong interest in old motor cars I was lucky enough to become the owner of a derelict Daimler Barker Special Sports. My attraction to this car was based purely on looks, the Special Sports is a handsome car by anyone’s standards. Once the restoration started I became fascinated with the Daimler’s quality of build and excellent engineering. 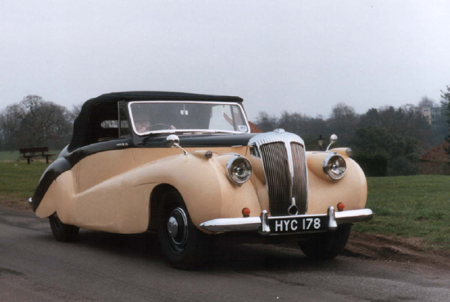 The very first drive in the Daimler added a whole new dimension to my motoring world, the pre-selector gearbox and fluid flywheel, I realised that I had been missing out on a largely forgotten driving experience. Any serious motoring enthusiast should sample the Wilson ‘self changing’ gearbox with Daimler’s fluid flywheel, it is a fascinating system that is simple to operate, yet gives the experienced driver much pleasure in mastering the techniques required to give his passengers a ride that is truly ‘as smooth as flight’. In the column on the right you will see a list of motor cars and subjects such as overheating and the Wilson gearbox: click on the subject title in which you have an interest. If you would like more information on any particular model or about the Daimler and Lanchester Owners’ Club, please contact me by submitting the form below. Kevin Bennett. Editor the Daimler & Lanchester Owners’ Club.